Have you noticed this? Sometimes they are small changes that you hardly notice, but if you look back over the past couple of years it is almost a completely different site. Facebook's purpose is to help people better connect to each other and that has not changed a bit, but their methods in accomplishing this goal has changed dramatically and likely will continue to change. Most people would advice Facebook to leave it alone. It's the best Social Network out there and people are comfortable with the way it is. Every time there is a new update you begin hearing complaints and threats of people that are going to shut down there account and leave. Do you ever wonder if it bothers people at Facebook when they hear complaints over the new features that they've worked so hard to develop? I'm sure that it does, but they have a bigger picture in mind for the online community that they have built. Their response then is to listen to feedback that is given while staying focusing on the goal at hand. The site would become stale and people would leave. Does this sound like any churches that you know? There is often a fear of people leaving if we do make a change when the reality is that our stagnancy often causes an even greater fall out. Facebook has not always gotten it right and neither will the Church. I can say confidently though if we do not try new things we will become stale and people will leave. What might have worked in the past will not always work in the future. The mission of the Church should not change, but the methods by which we accomplish that mission should always be changing. Take some risks, try new things, lead with boldness! A couple weeks ago I bought my first Tablet, an Acer A500. I honestly have been drooling over the iPad for 2 years but couldn't justify buying one. The cost was too high and one of my primary uses is CBC Online which cannot function effectively on an iPad because it does not play flash. I've been curious about Android devices for about a year, but I've been very committed to Apple as my past 3 computers have been Macs and my wife and I both have been iPhone users for several years. A friend at CBC, Craig, sent me a coupon though to Staples for $100 off a tablet making this Acer only $300 (half the price of the iPad). I began comparing it to the iPad and it had more functionality and better features. The Acer can play Flash, has expandable memory, a USB drive, and the list could go on. 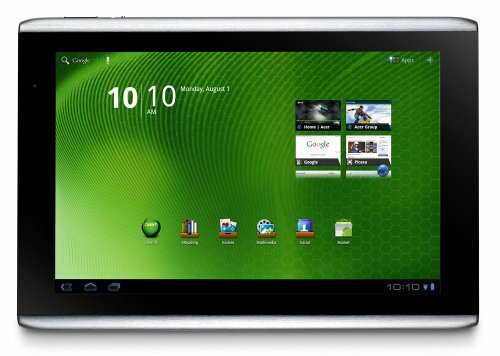 My wife gave me the green light and I leaped into the Android world and bought my first tablet. So far I have no regrets. I was able to buy a stylus and keyboard/case (that connects via USB) for less than $20 on Amazon and have been loving the flexibility that it provides me. It's not a perfect device and I still have a lot of learning to do, but I will say that my first 2 weeks as an Android user have been a lot of fun! I would love any advice on some great apps to download or any suggestions in maximizing the Android functionality (and flexibility!). By the way, those HTC phones sure do look fun to use!